Toby was born in 1984 in France to a multilingual artistic family that had him listening to Classical music from when he was a toddler. Seeing his first string quartet live was the catalyst that brought him to the cello, which he started studying from the age of 7. He progressed from the small music school near his home village to the regional Conservatoire in Dijon where he was taught by Laurent Lagarde, then went to Paris to study with renowned teacher Hélène Dautry, under whose direction he obtained his Diplôme d’Etudes Musicales in 2005. The love and discipline which she brought to her teaching were essential in his decision to make the cello his life’s work, and in 2006 he enrolled at McGill’s Schulich School of Music in Montreal, in the studio of internationnaly-acclaimed cellist Yegor Dyachkov. There, at the contact of some of the finest minds in the field, he discovered a passion for analysis and theory which led him to obtain, in 2011, a double B.Mus. degree in Performance and Music Theory. He also discovered the joy of orchestral conducting and, under the guidance of Maestro Alexis Hauser, he organized, rehearsed and conducted small ad-hoc orchestras of his schoolmates in well-recieved performances throughout his time in Montreal. He continued broadening the scope of his playing with intense chamber-music making, orchestral performances, and solo recitals, notably premiering up-and-coming composer Haralabos Stafylakis‘ Suite for solo cello which was dedicated to him. Over the years of his apprenticeship, he has recieved guidance in schools and summer festivals from many great artists in the Classical music field, most notably Johanne Perron, Jean Deplace, Mark Fewer, Kyoko Hashimoto, Douglas McNabney, and Roland Pidoux, as well as performing in masterclasses given by world-class musicians Timothy Eddy, Philippe Muller and Menahem Pressler. His graduation in 2011, however, marked the end of his interest in performing Classical music. Two hitch-hiking and busking trips through Europe in the preceding years (the first of which with only a didgeridoo), and a lifetime of frustration with the narrow-minded approach of his teachers in particular, and the Classical world in general towards music-making in its wider sense, drew him away from the path set out for him and towards a more complete understanding of the musical world we all inhabit. Burgeoning all through his education, and coming to a head towards the end of his degree, was a love of free improvisation; a simpler approach to harmony, a wide set of rhythmic possibilities, the joy of improvising in a group, dancing, simple tunes passed down through oral tradition, the jazz, pop, metal, blues and funk traditions, these are some of the keys that are not given the young cellist, and which Toby set out to explore from the street up, so to speak. His meeting in 2006 with busker guitarist and singer Aleksander Kusmić, a gifted and talented, entirely self-taught artist whose approach to music is completely alien to what is passed on in schools, was the defining moment which started the journey of self-discovery and research that guides Toby to this day, embracing whole new worlds of possibilities on the cello. He founded the acoustic duo Mad Kats with Aleksander in 2012, and has gone on in other bands Wild Strings Trio and Zamee to experiment with the fusing of Balkan tunes and songs with other styles, embracing the creative process that was so sorely missed in his education. His encounter in 2015 with the vast world of Folk music has led him in even more directions, in the form of collaborations with extremely talented and dedicated artists such as (but not limited to) Daniel Wall, Sofia Högstadius and Matija Solce; a particularly rewarding experience is his ongoing participation in a string quintet with fiddler and singer Kate Young, with whom he is performing around Europe. Toby lives and works in the musical crossroads that is Ljubljana, Slovenia. He still plays the didgeridoo, and has been known to fool around on other instruments; he can regularly be found indulging in inebriated singing and dancing. 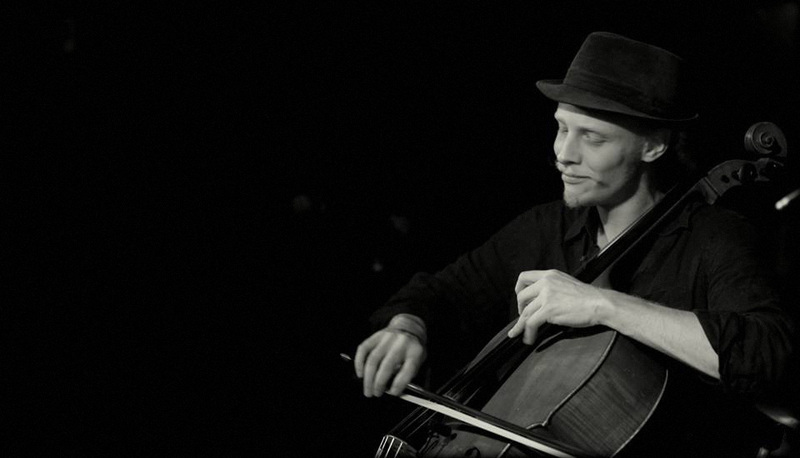 He plays on a 1995 cello by Günter Siefert, as well as on a custom 5-string baritone cello.